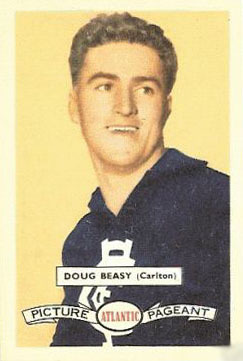 The son of 1932 Carlton captain Maurie Beasy, Doug Beasy was a fine player in his own right through nine lean seasons at Princes Park in the 1950s. An elusive midfielder-forward with neat foot-passing skills and an uncanny ability to lose his man, he won Carlton’s Best and Fairest award in 1956, and emulated his father by representing Victoria a year earlier. Born Douglas Edward Beasy, he was raised on the family farm at Dunolly and won his local club’s Best and Fairest as an 18 year-old in 1948. The following year he came to Carlton, and made his senior debut on a half-forward flank in the Blues’ first match of 1951 – a memorable game against Hawthorn at Princes Park. Beasy was quietly effective and kicked his first career goal that afternoon, but he was outshone by his fellow first-gamer Keith Warburton, who dazzled the crowd by booting seven goals on debut at full-forward, in a big win by the Blues. Afterwards, Beasy was eased into the senior side over the season, playing the first two, and the last five games of the year in guernsey number 17. Carlton wound up in seventh spot on the ladder and missed the finals, but Doug continued on with the Reserves and was outstanding in a hard-fought Grand Final victory over Essendon. Always confident of his ability, Beasy established himself in Carlton’s senior side in 1952, and didn’t miss a game. In 20 matches as a rover, half-forward or centreman, he kicked 20 goals and earned five Brownlow Medal votes – the third-best at the club behind Ollie Grieve and Fred Davies. In early September, he played finals football for the first time, when Carlton lost a cliff-hanger Semi Final to Fitzroy by a solitary point. But from then on, he was to make only two more finals appearances during his career – losing both - as the Navy Blues entered a period of mediocrity that was to last a decade. In June 1955, Doug Beasy and John James both represented Victoria against South Australia at the MCG. In his first representative outing, Doug came on to the ground as 20th man late in a game already won and had little influence. Two years later, on July 20, 1957 at the North Hobart Oval, Doug kicked three goals against Tasmania in Victoria's 25-point victory. Between those two games for the Big Vee, he edged out his good mate James to win Carlton’s Best and Fairest award in 1956. In 1957, Beasy celebrated his 100th game for the Blues by kicking three goals in a good win over Footscray in round 14 at Princes Park. By the end of the home and away rounds, Carlton had climbed back in the top four - only to be knocked out of contention in the first Semi Final by Hawthorn. Beasy shared the roving duties with Leo Brereton on that remarkable Saturday afternoon, when a monster hail-storm flooded the MCG at half-time, and the Blues lost by 23 points. Almost exactly two years later, Doug’s VFL career wound up when he limped off the MCG on the way to his third successive loss in a final. In front of 72,000 spectators on a sodden and windy MCG, the Blues were no match for eventual premiers Melbourne in the 1959 second Semi Final, going down by eight goals. Beasy didn’t play in the following week’s Preliminary Final loss to Essendon, and announced his retirement from VFL football at year’s end. In 1960, Doug was appointed captain-coach of VFA club Box Hill. Playing in the centre for the Mustangs, he won the 1961 Liston Trophy as the Association’s Best and Fairest player, even as his team languished near the foot of the table. Beasy wore Guernsey No. 5 during the 1950 season when he played with the Carlton reserves team. Doug Beasy passed away at Mildura on May 13, 2013, aged 83. In 1950, Beasy wore No.5 for a short period of time whilst playing reserve grade football for the Blues. "Carlton footballer Doug Beasy went out to the North Balwyn Methodist Church Sunday School anniversary Sunday to talk to children. He took with him a Carlton guernsey to illustrate some point in his address. "What is this?" he asked the goggle-eyed 300, pointing at the guernsey. They told him. "And what does this mean?" he asked, pointing to the entwined CFC on the front. They told him. "And what's this for?" he asked, pointing at the number on the back. One boy told him. "For when you get reported." As at 2013, the Beasy football genes are still represented at elite level, in the person of Hawthorn’s Brendan Whitecross. The grand nephew of Doug, and the great-grandson of Maurie Beasy, Whitecross is a 183 cm midfielder-forward. He was recruited by the Hawks at number 29 in the 2007 National Draft. Contributors to this page: Bombasheldon , PatsFitztrick , Jarusa , blueycarlton , tmd1 , molsey , WillowBlue , pblue , p(12)terg , true_blue24 , keogh and admin . Page last modified on Wednesday 05 of June, 2013 20:39:43 AEST by Bombasheldon. 1996 - Blues players singing song after win.